There must be a limit for the extend of Fourth Prime Minister Tun Dr Mahathir Mohamad in taking his obsession to oust Prime Minister Dato’ Sri Mohd. Najib Tun Razak. Coyly saying that His Majesty Seri Paduka Yang Di Pertuan Agong is “Probably under House Arrest” just because his whims and fancy of unable to present himself to the King should be seen as seditious. Tun Dr Mahathir is very impatient in getting his unconstitutional agenda, which is by his own admission, of ousting Prime Minister Najib followed through. So far, it has miserably failed. The past fifteen months, he has desperately tried assortment of tactics which failed throughout all the way. It is so unlike him, to fail any tactical manoeuvres he started. He tried his initial ceramahs all over the nation in getting the rakyat to uprise against Prime Minister Najib upon the outcry of issues pertaining 1MDB beginning early last year. Then he harped on the falsehood of “Bailout”, pertaining how the decision was derived by Tabung Haji (TH) to acquire a 67,954 sq.ft. parcel in Tun Razak Exchange (TRX). His associates tried to pull a run on TH but that failed miserably. His endorsed failed coup d’etat by way of pressuring Prime Minister Najib to resign last July by then Deputy Prime Minister Tan Sri Muhyiddin Yassin and former AG Tan Sri Gani Patail, only made had an adversed effect. Tun Dr. Mahathir attended BERSIH 4.0 illegal rally twice last August but that did not get traction. On the contrary, that drew to a landmark moment where previously so many those who admired, supported and gave him the benefit of the doubt toter their back against him. Then he pre-empted that “Prime Minster Najib would probably be arrested if he travels abroad and tried under ICJ”, when the latter was about to visit United Kingdom for a working visit and then attend United Nations General Assembly in New York last October. The Fifth UMNO President attempted to do a whisper campaign amongst UMNO General Assembly delegates in last year’s UMNO AGM but it did not follow through. He tried to instigate BN MPs to rebel against Prime Minister Najib and support Opposition’s moot to do a ‘Vote of No Confidence’ early last December but that failed too. Tun Dr. Mahathir did something very unethical when he revealed personal conversation to public in his ceramic in Ipoh. It was to the grave displeasure of the Dewan Rakyat Speaker Tan Sri Pandikar Amin Mulia, when very private materials he confided to the Statesman was shared in any open ceramah. Upon the submission of the MACC investigation papers (IP) of 1MDB and SRC International 31 December to Attorney General, Tun Dr. Mahathir pre-empted the outcome by stating AG would reject the IP as part of the demonisation of the Government. AG did reject the IP a week after submission. However, it was later revealed and admitted by MACC that the IP was defective and incomplete. The Fifth UMNO President summarily quit the party he lead for over 22 years. It did not create the snowball effect. In fact, against his favour that paved the way for UMNO Kedah leaders to rebel against his son then MB Kedah Dato’ Seri Mukhriz Mahathir. After two weeks of stand of, he eventually had to quit. When all failed to follow through as initiated, Fourth Prime Minister Tun Dr. Mahathir also took upon the challenge to take Prime Minister Najib to court. Tun Dr. Mahathir also joint forces with life long nemesis Opposition Leaders in the likes of Lim Kit Siang, Anthony Loke, Teresa Kok, Mat Sabu, Mahfuz Omar, Azmin AliAmbiga, Hishamuddin Rais and all the works, to launch his ‘Deklarasi Mahathir’ on 4 March 2016. 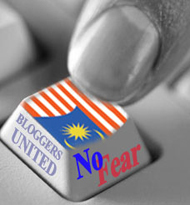 Until last week, the Anti Najib Campaign activist claimed that they have managed to amass “1.27 million signatories”, which 1 million of it came from online manoeuvres. The dubious claim have yet to be verified since many claimed they toyed with signing on the campaign and the tally still went up. Now, with Tun Dr. Mahathir’s claim of “1.4 million signatories”, he wanted to present them to His Majesty YDP Agong. It serves nothing but to create a drama, in the perception and effect that he and his ANC effort even get attention of His Majesty. Tun Dr. Mahathir must be stopped from all these unproductive political stunts. These stunts brought forth no productivity to the nation and actually is causing ripples to the effort to unify the nation. There are more prevailing agenda to get all citizens onboard and contribute, to ensure that the economy is stronger and brought forth better trickle down effect to household disposable income and quality of life. Clearly Tun Dr. Mahathir is way pass the abuse line in his own ultra-obsessive political agenda and self bastardisation of his position as a Statesman. The entire Central Executive Committee (CEC) of the Chinese Chauvinist Democratic Action Party (DAP) should resign for the dreadful performance at Sarawak State Election (PRNXI) on Saturday & May 2016. DAP contested in 31 seats but only managed to win 7. During the PRN X April 2011, DAP wrestled 12 seats and almost obliterated local Chinese Sarawak party SUPP. S’WAK POLLS As BN coasted to an easy win in the Sarawak state election, the results show that they have won more than two-thirds of the 82 seats available, with 87.8 percent of the House. PBB, led by newly re-instated Sarawak Chief Minister Adenan Satem, won all 40 of the seats they contested for a 100 percent win streak. 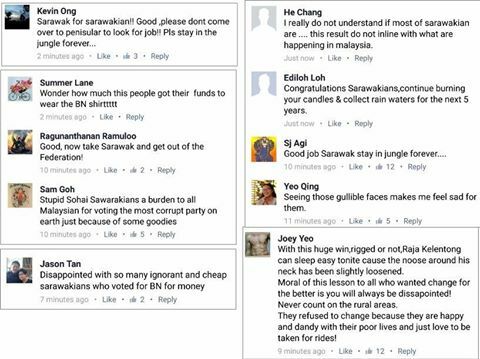 Another BN component party which won 100 percent of their contested seats was Sarawak Peoples’ Party (PRS), winning all 11. This is followed by BN direct candidates, who won 11 out of 13 seats contested, at 85 percent. Though Sarawak Progressive Democratic Party (SPDP) only contested five seats, they managed to win three, putting their win at 60 percent. Sarawak United Peoples’ Party (SUPP) which won seven out of their contested 13 seats, had an overall winning percentage of 54 percent. Combined, BN won 72 of the 82 available seats, which gave them their 87.8 percent super-majority in the House. Meanwhile, the opposition suffered a crushing defeat, with DAP losing five out of 12 urban seats it had previously held, as well as being defeated in all the bumiputera seats it contested this round. DAP only managed to win seven out of the 31 seats it contested, giving them a winning percentage of only 23 percent. Though PKR managed to defend all three of its seats, they did not win any new ones. Contesting in 41 seats, their winning percentage was a meagre seven percent. Meanwhile, candidates from PAS, Parti Amanah Negara, New Sarawak Native People’s Party, Star, and independents did not win any of their contested seats. This gave the opposition 10 seats out of the 82 in the state assembly. 11 new DUN seats were introduced as part of the re-allignation of the DUN Sarawak, to accommodate 82 ADUN members after the 11th Sarawak State Assembly. DAP dismal display to represent Sarawakians is apparent when their representation dropped from 16.9% of 10th Sarawak State Assembly with 12 out of 71 ADUNs to 8.54% of the 11th Sarawak State Assembly. That is a drop of more than 50% of their own political segment constituencies. In any examinations, any drop of 50% of last performance tantamount to bad failure. Hence, DAP CEC should take responsibility and resign and make way for fresh new leaders, to offer a brand new ideology for the party. The politics of hatred and Chinese Chauvinism DAP leaders managed to sow to sizeable pockets of Malaysian Chinese in Semenanjung is translated to the reaction via social media platforms.